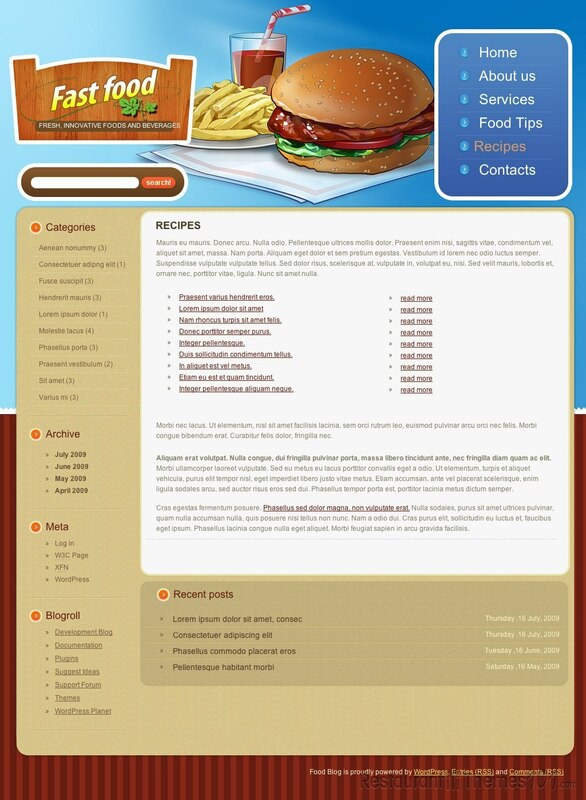 Fast Food is a basic looking WordPress restaurant theme created by Di, and featured on Template Monster. 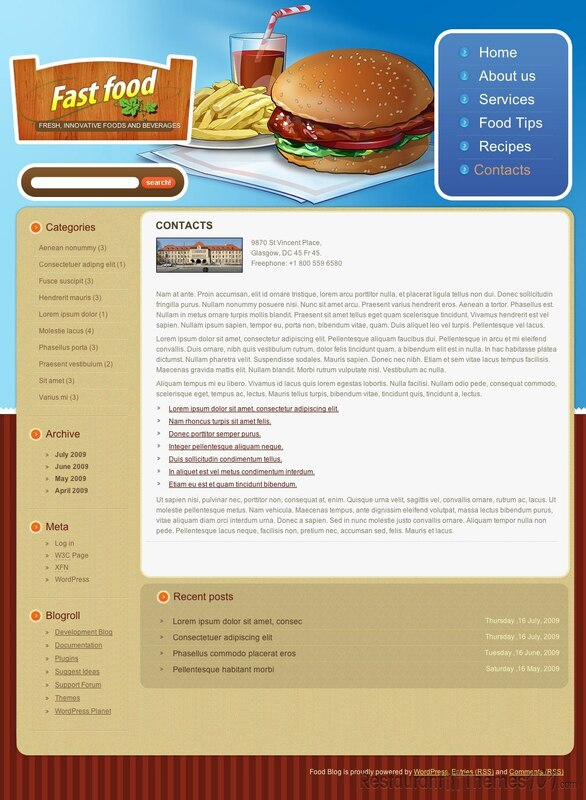 It is a theme that is perfect for fast food restaurants. The website is created in a blog style and it is very simple and clean with a beautiful set of colors and a modern, nice looking layout. Everything is put together nicely and the theme looks very lively with cheerful colors and a colorful picture of fast food on the homepage. You will have several sections to play around with in this theme. 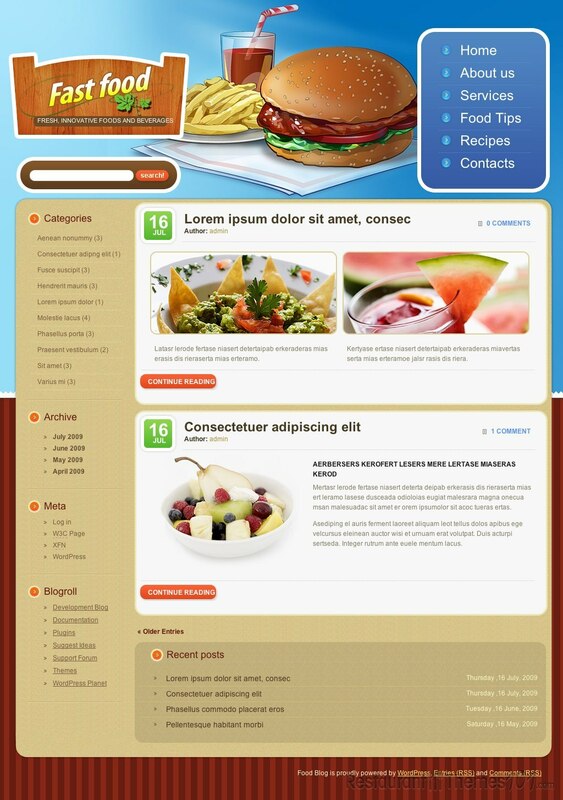 You can add footer tips where your customers can see what’s the best combination of foods, or maybe the most affordable food combination they can get at your place, or even your best-selling dishes, the newest dishes, etc. There is also the recipes area where you can put your whole recipes and show your visitors exactly what the food they eat is made of and how it is prepared in your restaurant. You can place your dishes in different categories and present them on your homepage so you visitors know where to look for what they need and they can find their favorite dish easily without snooping around the website for ages. You can also show your recent posts on your homepage and have the attention of your visitors stay right where it belongs- to your newest announcements and dishes. The theme is very easy to manage and it has a custom admin panel featured that will allow you to easily run and maintain your website. You can purchase the theme within several different packages, some of them include installation + domain, and of course there is the regular theme purchase. If you want further customization of the theme, you can select several customization services and have the theme customized to your own liking for a small extra fee.